A used BMW can offer fantastic features for a fraction of the cost of a new one. Who doesn’t love saving money on an inexpensive sporty luxury vehicle? Many of the concerns surrounding owning a used a vehicle is if it can it run like new, and will it last a long time? Since previous maintenance records may or may not be available, there are services you should have done when you get a new to you used BMW. The following checklist of items will help restore some of the power loss, make the engine run more smoothly, and possibly give you better fuel economy. A tune up can go a long way in an older vehicle that has some higher mileage on it. A common problem with vehicles is random misfires. It can cause power loss and stuttering in the motor. An easy way to correct this problem and give you a smoother ride is replacing the spark plugs and wires. Roseville BMW Mechanic, Ryan GMW can run diagnostics on your BMW to find out the source of your check engine light if there is one illuminated, and perform a tune-up. 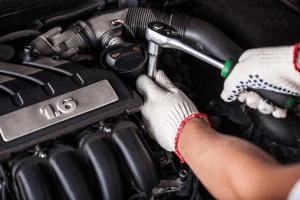 The initial thing you should always do when purchasing a used vehicle, and want to ensure the motor will remain healthy is giving it a fresh oil change. It may be the case that you don’t know when the last oil change was performed, so it is always a great idea to have one done just to be on the safe side. Engines need air flow, more importantly, clean air that is free of debris and particles. A clogged or dirty air filter will restrict air flow from getting into the intake causing sluggish performance. Replacing an old air filter that shows signs of age or is dirty will help with regaining lost performance and increase fuel economy as well. Older motors and higher mileage motors can become prone to leaks. It can occur in some places including the oil pan, and the valve covers. If you spot any oil leaks, it is a good idea to have them replaced. This way you won’t run out of oil, and risk possible engine failure. An expert BMW mechanic can remove parts and their gaskets that are leaking and apply a new gasket to stop the leaks. Fuel injector cleaners are an inexpensive additive that is inserted into the gas tank. Usually, the product contains a detergent that will clean many parts including the fuel line, injectors, and the cylinder head valves. Fuel injectors can clog over time, and this can cause your engine to be erratic and have a rough idle. Fuel injector cleaners can solve this problem by eliminating any debris that has been stuck to the injectors. It is a worthwhile product that might just make your used BMW feel like brand new again. Visit us for more details!